Description: No internet! It’s terrible. Anyway, after an arduous process we got the service appointment set up. They should be out soon to do the installation and then we’ll be able to get online. Cost: $0 to remove, disposal? Description: The cupboard doors are not good. They had to go. It looks much better without them. Later on we’ll repaint the wood and eventually remodel, but for now it just needs to be opened up. Description: The house came with all appliances, which was good for just moving in but the clothes dryer doesn’t actually dry the clothes. It might just be an easy fix, but it’s also so small that you can’t do a large load or blankets. Update: Ended up getting a new 6.5 cu foot capacity dryer at Lowe’s. They brought it out, laughed over the old dryer, and installed the new one on the 1st. Description: Our nearly 40-year-old house has a number of outlets with wiring problems and others so loose that a two-pronged cord will just fall out. It’s time to get all of the outlets replaced. 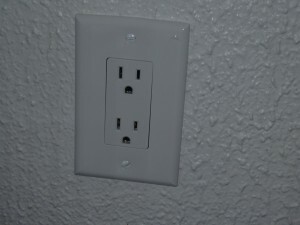 There are X outlets in the house. Updates: We have the parts and tools, now I just need the time to do it. We got the keys later than we’d thought. We’d expected since we signed early in the day we’d get the keys early. That didn’t happen. It was nearly 7:00 PM before we got the keys. Since the water was off in the house (and it was late) we couldn’t do everything we wanted. I did get the place vacuumed at least. Today we’re getting the truck and moving! Yesterday we signed the papers on our new home. It’s pretty exciting. We’ll have a lot to do to get our homestead the way we want but it starts today. Later today we should get recording numbers and then the keys are going to be dropped off with me at work. I’m doing a half day and heading over to the house once I have the keys. I’ll meet Kate there to clean the place before we move in everything. The work starts right off the bat. Tomorrow we’ll come back and I’ll go get the truck and begin loading up everything to move. Plants first and a few other awkward items, as much as I can fit and then the next trip will be big stuff. Furniture, bookcases, and as many boxes as I can fit. I’m sure it’ll take longer than I expect but I want to get all the larger stuff moved before I return the truck. Yesterday was supposed to be our closing date. That didn’t happen. Things are moving forward but not as quick as we’d hoped. I discovered yesterday that the pool which we’d been told was down was in fact still up. I drove past the place on my way to work to just look at it and noticed. That’s a problem. I called our real estate agent and he’s supposed to follow up on it. No idea how that’s going because we haven’t heard from him since. We’d also like to do a walk through before we sign but I don’t know if that’ll happen or not. We hope to sign tomorrow but it might not be until Tuesday. Assuming that the pool is taken care of and there are no other delays. We also want to know that the electrical panel has actually be replaced. So we wait. At least we didn’t have to be out this weekend. If things had gone the way I wanted we would be moving stuff today. Instead we wait. Next week we should be closing escrow on our new property. This is a huge move for us to finally get out of an apartment and into a place of our own where we can raise animals, garden and do all of the things we’ve been dreaming about for years. We’ve been getting all sorts of books in anticipation of everything we want to do. Clearly we can’t do it all at once so we’ll have to prioritize what comes first. Right now we need to get through the buying process. If everything continues to go well we could be looking at having the keys in our hand within a week. As we get closer certain tasks are rising to the top of the list. We want to give the carpets and everything a good cleaning before we put in a bunch of furniture. I’m sure we’ll go through the place after that and identify those things we want to address first. Some outlets need to be fixed, I already know. There are other things like painting colors we want. Or even big projects like relocating the washer/dryer and remodeling the kitchen. Installing Solatubes in the hallway and maybe a couple other locations. Fixing the fireplace. Redoing the flooring. Solar hot water. Solar power. There’s lots of ideas limited only by funding and time. And that’s just the house. Moving outside the house there are also tons of possibilities. Gardens! That’s a given. After being restricted to a small container garden on a shady porch this is going to be fantastic. Lots of ideas there. Fruit trees are already on the property but we’ll be working on making those better. Bee hives. Animals, including chickens, rabbits and goats. Again, only time and money limit what we might do. So this is very exciting. We can’t wait. I’ve just set up the blog at it’s new home. Up until now WoollyDragon.com has been redirecting to our personal site but I hope to start getting things ready for our big move out of the apartment to the country. This blog will track our progress and eventually will be a place to feature our animals and fiber that we plan to sell as well as other materials sold in association with other sites.